I can honestly say that the Bladez Fitness Echelon GS Indoor Cycle has helped me to change my life. At the age of 35, I have come to realize medical conditions due to lack of exercise really do exist. Astonishing, isn’t it? I always enjoyed cycling, so I did some research on an indoor bike and decided this would be the best model that fit my budget. What struck me at first was that it was easy to assemble, had features like a water-bottle holder and digital display, was adjustable, and easy to store. These things may sound simple, but I was a novice when it came to purchasing exercise equipment. As I came to understand the mechanics of the bike more, the technical information that came with it started to make a little more sense. All I cared about was making sure that my heart rate was getting to the point it needed to in order to get my health back into order and to drop these few extra pounds that I had gained over the past decade of working a desk job. The Echelon Indoor Cycling Bike has many features that novice and professional riders can enjoy. It has an emergency brake, is quiet, smooth momentum feel, a digital LCD monitor that rates your calories, distance time and speed, comfortable handlebars, as strong frame, racing ergonomics which make it much more comfortable, and a sport saddle which helps your back keep the correct posture. The Bladez spin bike offers a variety of features on the LCD screen that help to continue your motivation during the workout. It helps you to keep track of calories burned, distance. Speed and time spent on the bike. This was sufficient, although it did not come with a heart-rate monitoring device, which would have been useful. The manufacturer offers a lifetime warranty on the Bladez fitness spin bike frame. For other components, such as the computer, wear, labor and parts, the company offers a one-year warranty. I never felt that I had to utilize this during the duration of owning the bike. This exercise machine was a lot easier to assemble than some of the other models that I looked at! Actually, when it came in the package, it was mostly all put together, and it included the tools that you needed in order to complete the assembly. It took maybe forty-five minutes from start to finish putting the bike together. I looked at various sites for the best price and found that shipping was different from site to site as well. To download Bladez Fitness Echelon GS Bike Assembly & Owner’s Manual click here. This bike was a great machine for me to start out on. I haven’t exercised in a really long time, and it was very simple for me to put together and use the first time. I understood the controls and mechanisms, it wasn’t terribly hard for me to get going or keep going with the ease of the flywheel, and best of all it was so quiet I could watch television while biking to pass the time. However, there were some downfalls to purchasing this bike. As I became better at cycling, I realized that the resistance didn’t really have the capacity that I needed…like it only had three different settings. Although it was great for a cardio workout, if I wanted to boost my leg strength, this was not the machine that allowed me to do so. Also, overtime, the bike began to break down a little and make some squeaky noises. I put some lubricant on the gears after the first month, and it helped a little, but believe me, I began to question the bike’s safety. The seat was also a little hard- although I just chalked that up to just being “ergonomic” and my bottom not being used to sitting on that kind of saddle. 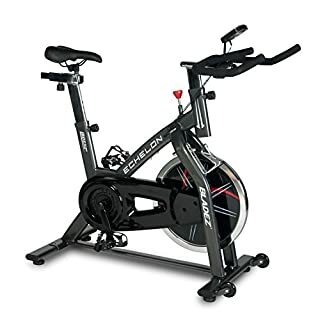 The Bladez Fitness Echelon GS Indoor Cycle was the perfect exercise machine for me to purchase after years of not exercising. It was simple enough for me to assemble and use, didn’t take up too much space, and it had the controls that I needed to stay on top of my fitness goals. As my ability increases, I may look for a more professional bike that may not have the complications of breaking down over time, but this was a great initial investment that didn’t break my wallet and motivated me to continue my regimen, even while cycling and watching television simultaneously.